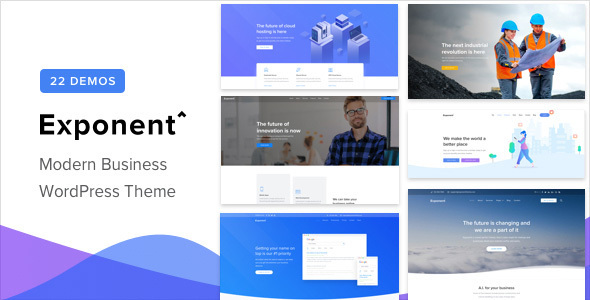 Exponent is a modern business wordpress theme, that lets you build stunning high performance websites using a fully visual interface. The theme comes with 22 premium pre-built demo websites, that you can use as a starting point for your website. Exponent has been built by the same team behind Oshine, one of the all time best selling themes with over 23,500 customers. We have built the theme using years of our experience, customer feedback and a framework that has been battle tested in 1000’s of live websites. No doubt, Exponent is our best theme yet. Over 22 high quality professionally designed pre-built websites to choose from. Comes with 100’s of pixel perfect unique layout blocks and pages. One look and you know there is something magical about the theme. The magic comes from a design system built upon consistency and terrific attention to details. Clean & Modern: Perfect blend of spacious layouts, precise typography and trendy design elements like gradients, illustrations, shadows & shape dividers. Professional & Multipurpose: Carefully crafted after analyzing the needs of different industries and the design achieves a great balance between purpose & presentation. A Powerful and Elegant live front end site builder for WordPress, that comes with 50+ styling modules, a live text editor and pre-built concepts. It makes building web pages a breeze and is loved by newbies and pros alike. Get started swiftly & easily by importing a pre-built website of your choice in a single click. Import multiple demos, mix & match pages and customize to your hearts content. Exponent comes with 8 unique styles and by customizing things like typography, aspect ratio, spacing, meta info, backgrounds & colors, you can literally style your blog in unlimited ways. Showcase different formats of content in ways they are meant to be consumed and add flavor to your blog. Exponent supports Video, Audio, Quote, Links, Gallery & the Standard Post Formats. From content width to spacing & typography, the posts have been optimized for an amazing reading experience. Single Posts come with bold title area and all the little things like social sharing, meta info, author info, comments & post navigation bar, have been designed with care. Build a full fledged, highly functional store powered by WooCommerce to sell your products online and grow your business. Built with conversions in mind, Exponent uses clean layouts and crisp typography to offer a smooth & intuitive shopping experience. Your products are your website’s heroes, showcase them in style. Choose from a 2, 3, 4, 5 or 6 column grid. Choose from a regular or a fixed panel layout. Let your visitors zoom in on products or expand them in a lightbox. Showcase multiple images in a slider. Supports all product types like grouped, variable & external affliate products. All the pages associated with a shop like Cart, Checkout & My Account pages have been designed with care & precision. Showcase your work in style, using stylish grids & crafty project pages. Galleries, Carousels, Fixed Sidebars, Lightboxes, Videos, you name it, we have it. Infinite Grid Styles: Use 2, 3, 4 or 5 columns, vary spacing, size & aspect ratios. Stylish Hovers: From simple to stylish, choose from 6 different pre-built styles. Envato Power Elite Authors One of the top companies in the Envato marketplace and we already have a place in their wall of fame. Moreover you would be using a tried & tested framework from a trustworthy company. 15000+ tickets resolved & 6000+ Comments answered. Exponent comes with our proprietory BE GDPR plugin to help you make your site GDPR Compliant. Choose from 1000’s of fonts from Google as well as Adobe (Typekit ). Control typography for various screen sizes, play with different font schemes & download google fonts to your server for GDPR compliance. Change colors across your site with just a snap of your finger. Light & Dark Skin: Choose a color scheme for the editor based on your preference or ambiance. We had to rebuild our entire UI system for this. Streamlined Editing Interface: Clean and Consistent organization of settings using Tabs and Panels. Birds Eye View: A single skeleton that gives you a complete picture of the entire page. Drag and Drop to re-order, double click to edit. Revisions History: Go back in time to any of your previous saved states. Pre-built blocks & pages: Over 60 blocks from various demos to help you build your pages rapidly. Faster Loading: The editor loads 2x-3x faster than before. Custom CSS & JS: Complete power to the Pros. Blend Modes: Produce photoshop-like effects using overlay blend modes on section and column backgrounds. Better Search: Easily find options that you are looking for. Highlighted and Grouped. Page Reload: Not happy with your edits and want to start over? Just reload the editor. Typography: Full responsive control over the typography of text & inline text modules. - Fixed : WooCommerce My Account dashboard links.